I rarely ever have butter on hand. It’s odd, I know. Julia Child would not be impressed. So when I set out to create a proper French onion soup, I thought there’s no way I could get away making it without butter. But I did. In part because I like a challenge. And, in larger part, because adding butter meant walking down my endless stairs to the grocery store where I’d likely buy a product that I wouldn’t normally use. Sure, this soup may be a little healthier, but it doesn’t skimp on flavor. 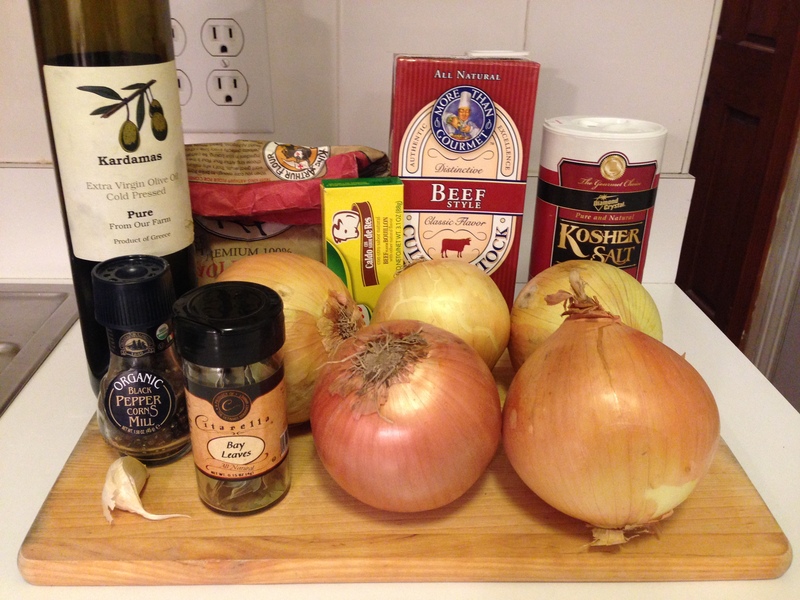 It’s chock full of onions (just the way I like), and still has all that beefy flavor we all love. It’s perfect for those chilly fall afternoons watching Sunday football at home. And because Fieldhouse Kitchen recipes always do things a little differently, I opted for Gruyere grilled cheese croutons. To that, I say, game on. 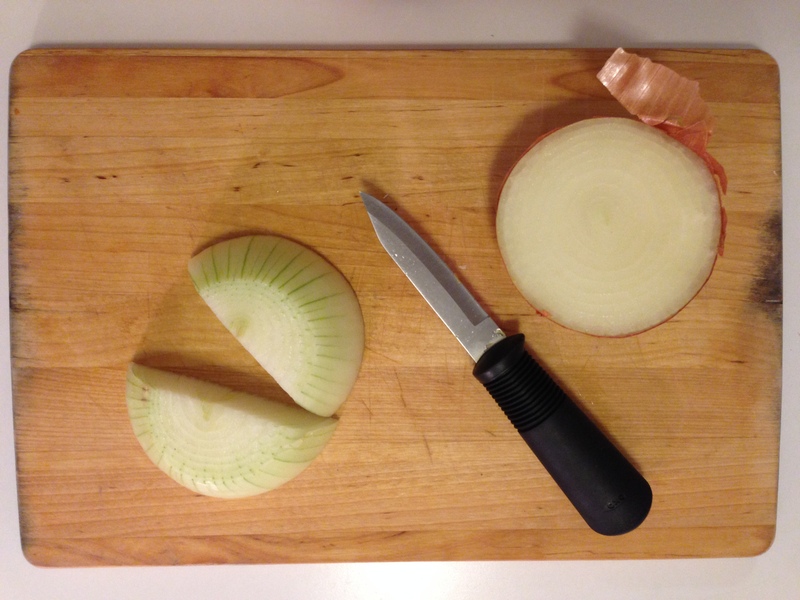 Begin by peeling and dicing your onions. I cut them in half, then slice them lengthwise into strips. Place a pot on the stove with your olive oil over medium heat. 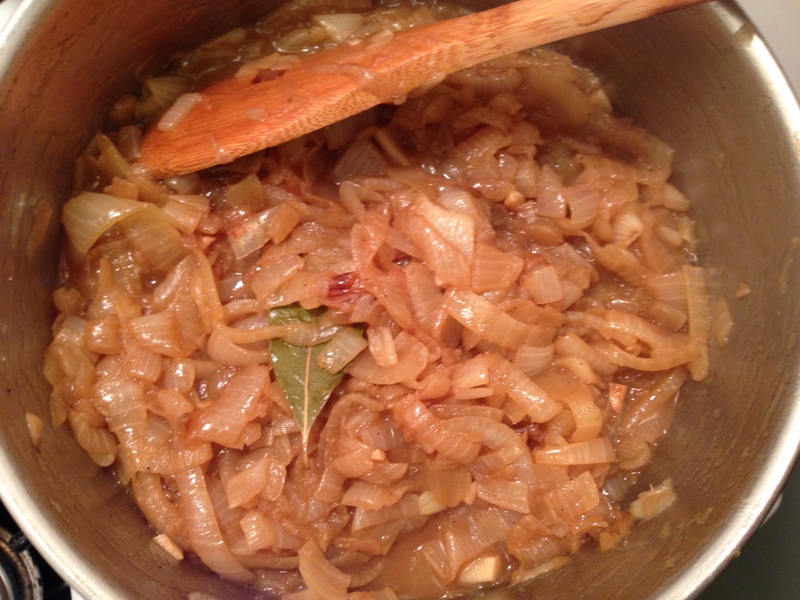 Add your onions, garlic and two bay leaves. You may need to use two pots if you don’t have one large enough. 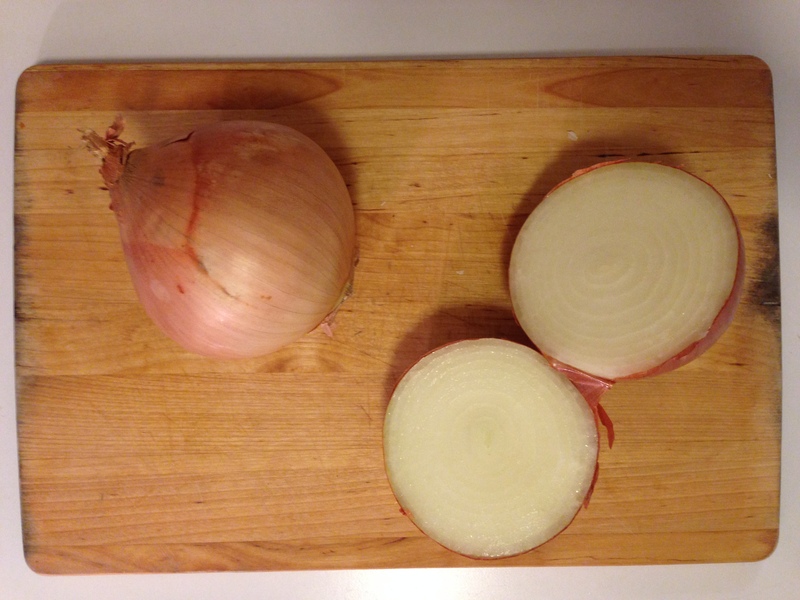 And don’t be scared by the amount of onions. They cook down as they caramelize. 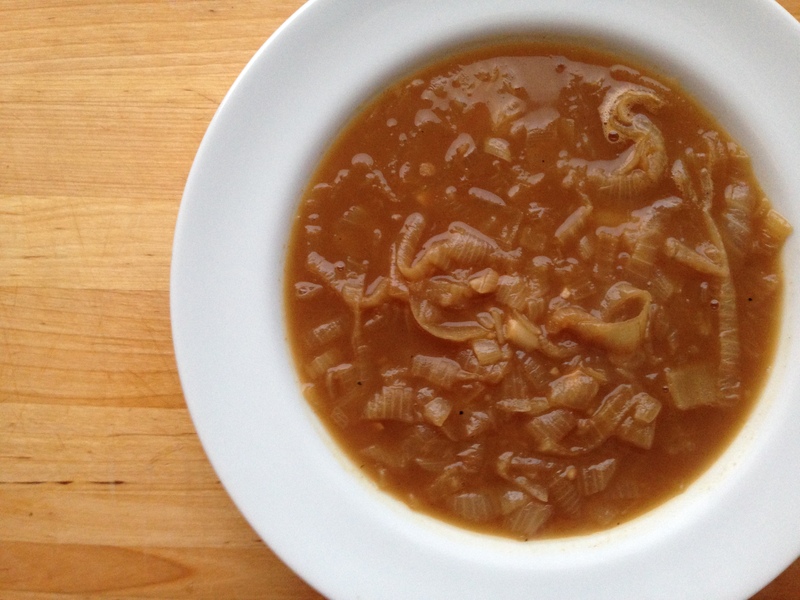 If you prefer fewer onions in your soup, use only four onions. 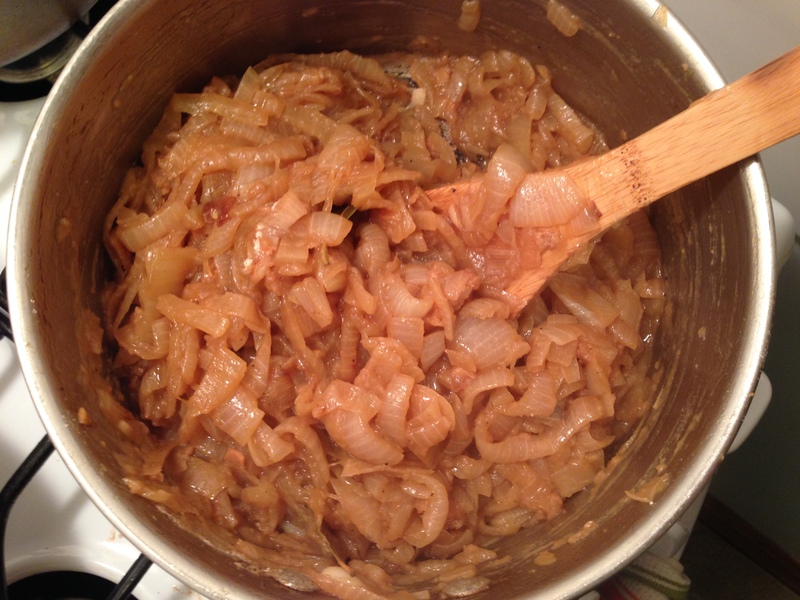 Cook the onions for at least 45 minutes, stirring occasionally as you go until they develop that rich, dark flavor. 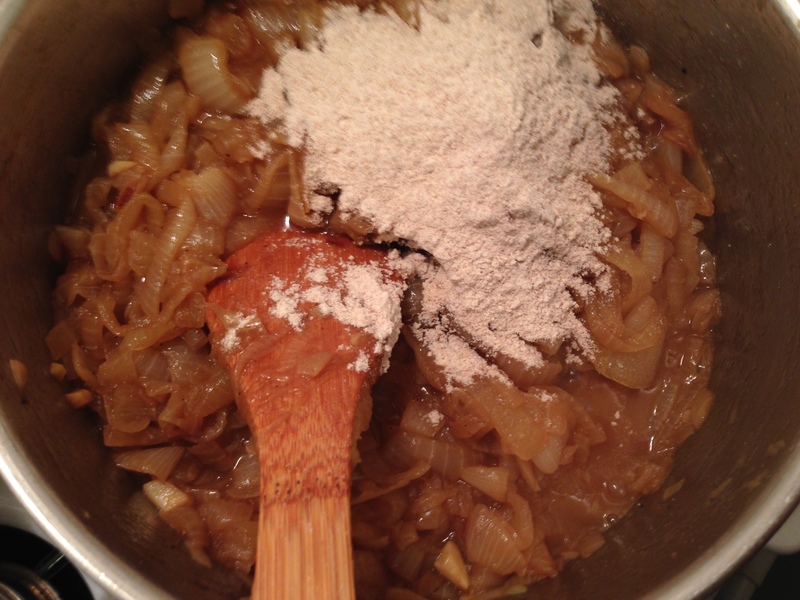 Add in your flour to your caramelized onions. Stir and continue cooking for another 10 minutes just to cook out that raw flour flavor. 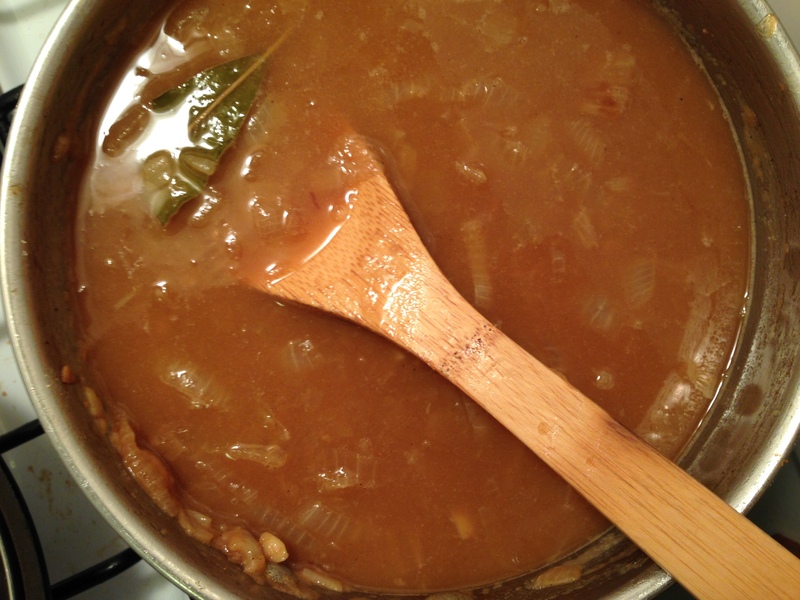 Next, add in about a cup of your beef broth and beef bouillons. Stir until the bouillon is melted. Now add in the rest of the broth and simmer the soup for another 10 minutes or so, so that all the flavors can meld together. Remove the bay leaves and serve with Gruyere grilled cheese croutons (this is of course if you don’t have those fancy little soup bowls that are broiler-friendly). 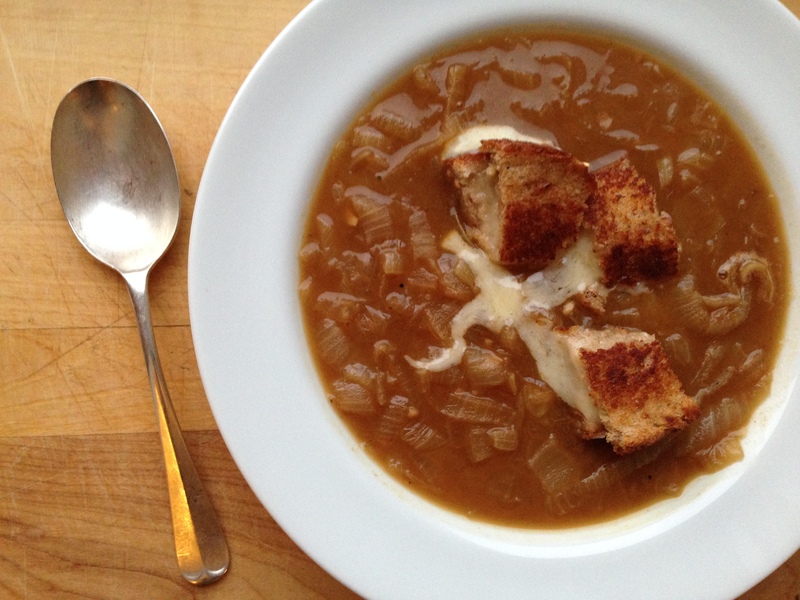 To make the croutons, make a grilled cheese with Gruyere cheese. Slather both sides of the bread with mayonnaise (not butter) to get that golden crispy crust. Cut into cubes and place on top of the soup when ready to serve. 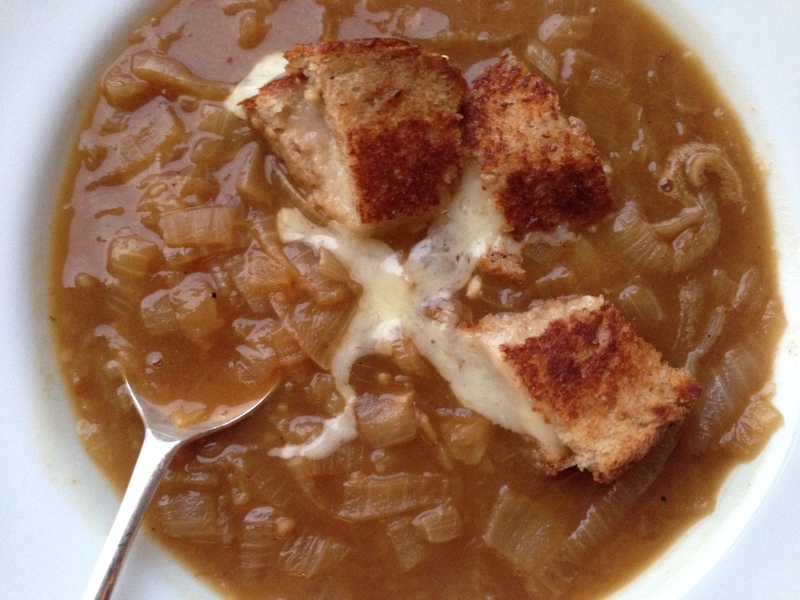 Fieldhouse Fun Fact: I use Gruyere croutons for my French Onion Soup because I only have a few bowls in my kitchen and none of them can be placed under the broiler.